What Operating System (OS) is installed? Please download and install WinDirStat. Click on the desktop icon to run the program. When the pacmen have finished there will be a graphic display of your drive. Place your cursor on the divider line between the text above and the color graph below and drag downwards to expand the upper portion of the resultant image produced. If you are unable to attach or upload, you might have to create a photobucket acct. (if you don't have one) and upload there to post the link. If you have any trouble provided the needed information, please don't hesitate to ask questions. Last edited by DonnaB; 02-06-2013 at 12:56 PM. How much free disk space do you have? Have you scanned for malware? If so, with what? how come you're so positive about that ... anti virus programs are not 100%, some malware can get around them and really mess up your PC. If it looks like you have malware, we have some excellent malware/spyware experts that are willing to help (note, we are a volunteer site and any and all help we give is free of charge). WinDirStat should install. It is merely 733kb's in size. Please let us know if you are able to do so (or not). Personally, I was wondering if backups might be taking away the free space, but Canuck makes a very good point concerning the pictures, videos, etc. 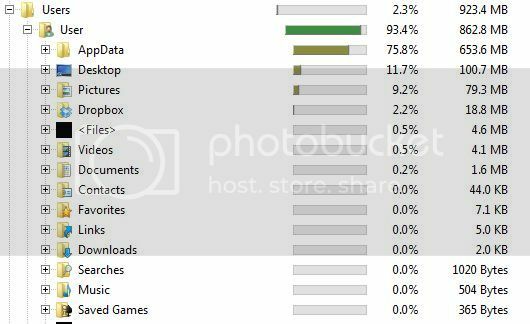 Either way, we need to see what is taking up that space and WinDirStat at this time is the way to see what is taking up the most space on the hard drive. 413 "megabytes" free? Did you mean that? If so, then that is certainly your problem. I generally recommend having at least 30Gb (that's giga, not mega) bytes of free disk space available. Some experts say 30Gb or 10%, whichever is larger - so that would be 45Gb for you. It appears that whatever is taking up all the space is in the User folder. Could you please run the program again and click on the little + sign to the left of the User folder to expand, then click on the next little + sign to the left of the User acct that displays where the most space is being taken up? Please post that screen shot. Below is an image of "my" user account that is expanded within WinDirStat to give you an idea of what I need to see. Your's might have your name on it, or whatever name you decided for your User acct. (profile).